Hello there. Just a quick post on the Jelbrus Secure Web adware. If you have Jelbrus Secure Web installed and running on your computer, you will notice privoxy.exe and mlwps.exe running in the Windows Task Manager, a new services installed, pointing to privoxy.exe and mlwps.exe , changes in your LAN proxy settings and a new add-on installed in Internet Explorer called SecureWebBho. There was no entry in the Add/Remove programs dialog for Jelbrus Secure Web when I tested it. You may run into this adware infection if you are visiting sites, such as ThePirateBay. I’ll show how to remove Jelbrus Secure Web in this blog post with the FreeFixer removal tool. As always when I test some new software I uploaded it to VirusTotal to test if the anti-malwares there find anything fishy. 9% of the scanners detected the file. The Jelbrus Secure Web files are detected as TR/Trash.Gen by Avira, Backdoor.Win32.Bifrose.fsi (v) by AVware, Packed.Win32.Krap.hc by Kaspersky, Bloodhound.MalPE by Symantec and Backdoor.Win32.Bifrose.fsi (v) by VIPRE. You probably came here looking for removal instructions for Jelbrus Secure Web and you can do so with the FreeFixer removal tool. Just check the Jelbrus Secure Web items as the screenshots below shows. You might have to restart your machine to complete the removal. Did you also find Jelbrus Secure Web on your machine? Any idea how it installed? Did you also get it from The Pirate Bay? Please share your story the comments below. Thanks! Howdy, so i found this virus on the eighth, its caused a lot of problems these last few days, ive tried just about everything outside of nuking my hard drive, freefixer also wasnt able to get it. Its showing up in a folder in my x86 program files, “C:\Program Files (x86)\SmartComp Safe Network”, and nothing can access it at all, it just showed up as an error with free fixer. Help? Hello MJ, what does the error message say? Does the error message appear in the scan result, or does it appear after selecting the SmartComp files for removal and clicking the Fix button? Hi and thanks a lot for this post! Got infected just yesterday downloading a book at piratebay and couldn’t even access the internet on my computer until I realized it had added proxy settings I don’t need. 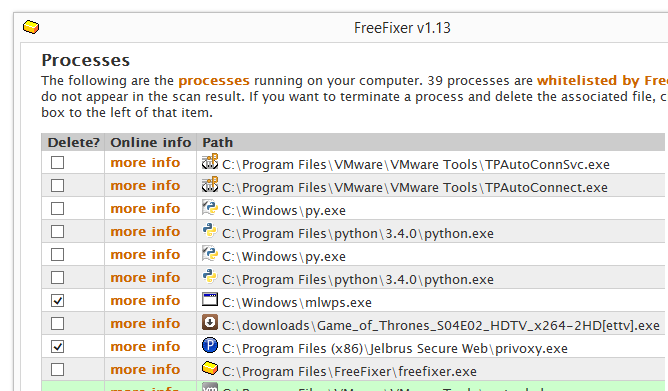 Freefixer cleaned it out, along with the files you mention. I had also aquired a winupd.exe along with the jelbrus secure web, freefixer found this as well. On my computer the program files were named “C:\Program Files (x86)\Safesoft Protector”. Once again thanks and keep up the good work! Thank you very much for the feedback! Happy to hear FreeFixer helped you with the removal. I Got the virus removed by a friend of mine but did it another way. .. he had the smart comp safe netwerk on his computer. Once removed i cant get his Internet back up. Keeps saying there is a proxy problem.